Offer your guests a unique space to set their drinks down at your next party with this industrial end table. 100% solid parota wood construction and a live table edge create an interesting two tone natural piece that will be sure to grab the eye of anyone who sees it. 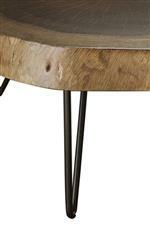 Wrought iron table legs create a distinct combination of modern and rustic style, ensuring that this end table will feel right at home in your contemporary living room. 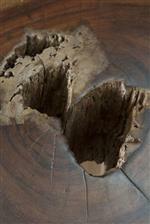 The Vivo Industrial Live Edge Solid Wood End Table by International Furniture Direct at Reeds Furniture in the Los Angeles, Thousand Oaks, Simi Valley, Agoura Hills, Woodland Hills, California area. Product availability may vary. Contact us for the most current availability on this product. Constructed from 100% solid parota wood, this unique collection of live edge occasional tables is exactly what you need to create the unique modern living room of your dreams. The Vivo collection is a great option if you are looking for Rustic Industrial Contemporary furniture in the Los Angeles, Thousand Oaks, Simi Valley, Agoura Hills, Woodland Hills, California area. Browse other items in the Vivo collection from Reeds Furniture in the Los Angeles, Thousand Oaks, Simi Valley, Agoura Hills, Woodland Hills, California area.